YoY results are down for Tegra processors and professional Quadro and Tesla GPUs. 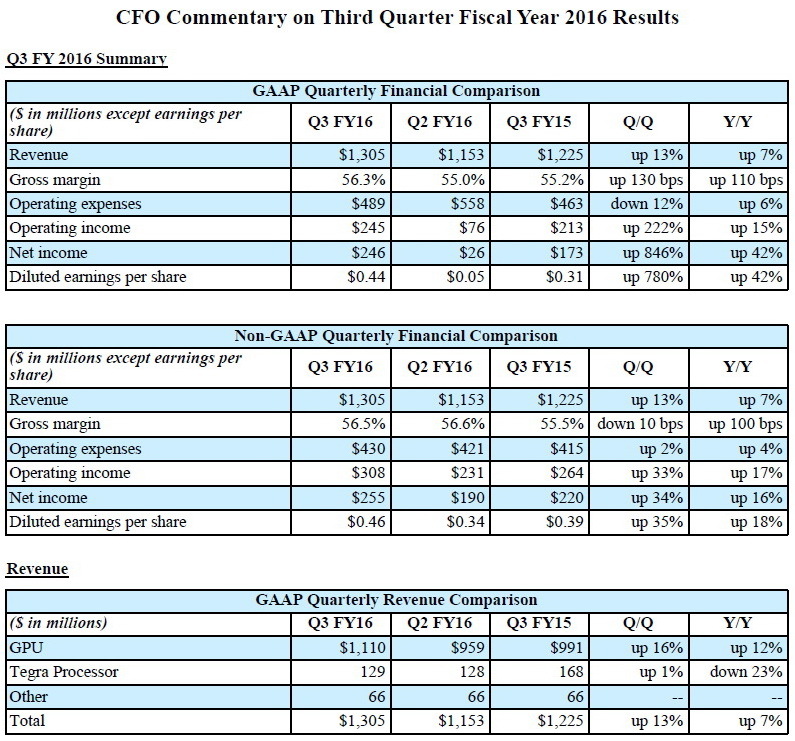 Nvidia has announced its latest financial results for Q3 FY2016 ending on October 25, 2015. The company has recorded a quarterly revenue of $1.305 billion USD compared to $1.225 billion a year earlier. 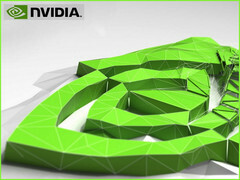 This represents an increase of 6.5 percent for Nvidia. 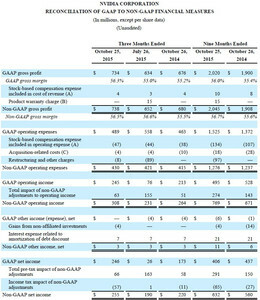 Its 9-month YoY revenue has increased from $3.431 billion to $3.609 billion USD. 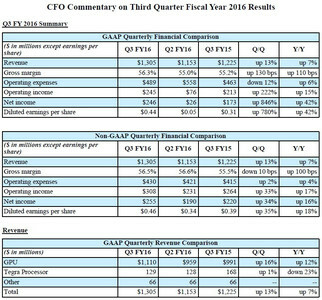 For Q3 FY2016, Nvidia posted operating profits of $245 million USD, which is up from $209 million USD as of FY2015, representing an increase of 17.2 percent. Net income is up 42.2 percent from $173 million to $246 million USD. In 9-month YoY comparisons, operating profits have actually fallen slightly by 6.7 percent from $528 million USD to $495 million USD. 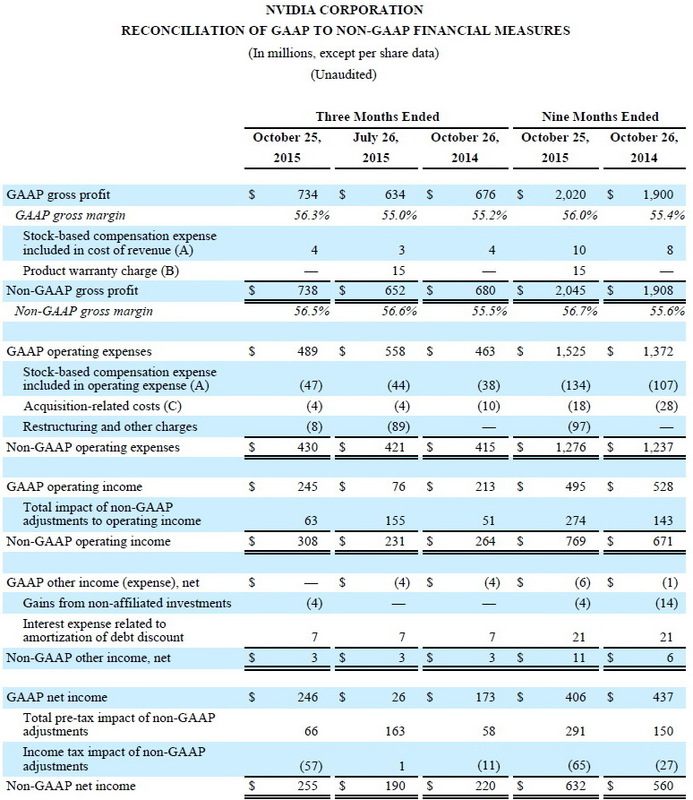 Net profit has also fallen to $406 million from $437 million (-7.1 percent) during the same time frame. The strongest revenue driver for Nvidia is again from its GeForce GTX series of gaming graphics cards. Here, Nvidia boasts a sales increase of 40 percent. Meanwhile, the Quadro, Tesla, and Grid sales have fallen 8 percent YoY. Sales of Tegra processors have also plummeted by 23 percent YoY. Nvidia has posted a turnover of $761 million USD for its gaming sector compared to $528 million during Q3 FY2015. Sales of Pro Visualization have fallen from $206 million USD to $190 million USD. The Data Center and Tegra OEM sectors made $82 million USD and $192 million USD, respectively, down from $90 million USD and $350 million USD a year earlier.